There’s been a lot of talk about the “supermoon.” The moon will be full tomorrow morning at 5:52 a.m. here on the west coast, and will be the closest, largest full moon since 1948. The moon will be 7% larger and 15% brighter than the average full moon – not a huge difference, and not obvious to most observers. Photographically, a small change in focal length has a much larger impact on the apparent size of the moon than how close the moon is to the earth. Nevertheless, all this talk about the moon (along with some urging from Claudia) got me thinking about photographing it. The Tioga and Glacier Point roads are open, allowing me to reach some areas that are normally inaccessible this time of year. Since the full moon rises further to the north (left) in November than in July, I thought it might be possible to find an interesting juxtaposition of moon and mountains that I wouldn’t see in the summer. After consulting Google Earth and The Photographers’ Ephemeris I decided to go to May Lake yesterday. 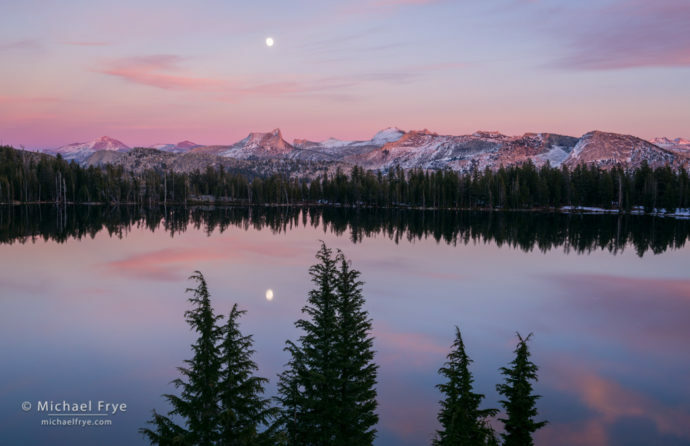 That seemed like a good spot to see the moon rising over the Cathedral Range – without the smoke from backpacker’s campfires along the lakeshore that you’d usually see in summer. I guessed (correctly, as it turned out) that the spur road to the May Lake trailhead would be closed, turning a one-mile hike into more than two-and-a-half miles each way. That meant I had to get an early start, so I started hiking a little before two o’clock, which gave me just enough time to get to the lake and scout before the moon was due to rise at 4:15. The west shore of the lake is steep, requiring some rock scrambling to negotiate. But I was able to reach a spot above some mountain hemlocks, which I thought would look interesting silhouetted against the lake. When the moon first rose behind Mount Gibbs (second peak from the left in the photo) it was rather pale, but as the sun lowered the sky got darker and the moon stood out more. Meanwhile some high clouds started moving through, adding interest to the sky. The wind died, smoothing out the surface of the lake, and the moon rose high enough to be reflected in the water. I couldn’t have asked for better conditions, and the scene kept getting more and more interesting. This photograph was made just after sunset, with the last light on the peaks and the clouds turning pink. It was a long hike back to the car in the dark, but the moonlight made the forest beautiful and mysterious. Despite my reluctance to buy into the “supermoon” hype, I’m glad I went, because it was a great experience and a fun adventure. If you’re thinking of photographing the full moon, it usually works best to do so at sunrise or sunset rather than at night. After dark the moon is so much brighter than the landscape that it’s impossible to get the right exposure for both, so either the land will be completely black, or the moon will be washed out. Around sunrise or sunset you can get a better lighting balance between the two and get detail in both the moon and the landscape. Tonight, however, the moon will rise just after sunset, and tomorrow morning it will set just before sunrise. It’s still possible to get a good lighting balance between the moon and landscape tonight, with the moon rising amidst the pink after-sunset glow in the sky to the east, but you’ll have to have a clear view of the eastern horizon so that you can see the moon just as it rises. It should also be possible to balance the exposure between the moon and the landscape tomorrow morning (also with a pink glow in the sky), but you’d need a clear view of the western horizon. In both cases some bracketing and blending of exposures might be necessary. And if you miss out on photographing this month’s “supermoon” don’t worry – there will be another one next month. Technically the moon won’t be quite as close as this month, but you won’t be able to tell the difference in photographs, and it will be just as beautiful. PS… when you gonna share those rainbow pics from monolake a few weeks ago.. your holdin out! I’ve made many images this fall I like better than those rainbow photos, so I’m not likely to post them. This raises an interesting topic mike. I often see blogs and photography articles online about “how to take a good picture”, the hows and the whys and that is fine. In life to do anything well, it takes time and experience and mentors, that is all important. But me, I’m often interested in the other side of our work, the mindset.. the trials and tribulations we go through in the life pursuit of obtaining that skill… the workings aside from the mechanical camera settings, lens choices, framings and million other things we need to learn and do just to consistently try to snap a working image. For instance, we all know that you take amazing photographs and that you have an incredible wealth of knowledge and experience. I wonder do you have days where it just goes all wrong? Do you sit at your screen and curse the gods, ever!!! HOW COULD I STILL DO THAT?!? Maybe someday you could share a story with us about that too. Your comment on your rainbow pics had me thinking on my long ride along the PCH this morning into Hollywood. Thanks for sharing your knowledge to the masses. Well I don’t sit at my screen and curse the gods. I do sometimes make technical mistakes, though that’s become pretty rare. If I’m not happy with a photo it’s more often because I didn’t find the best composition, or maybe conditions just weren’t suitable for what I was trying to do. Anyway, I’ll think about your idea and if some story along those lines seems relevant maybe I’ll post it.